As I grieved over the recent earthquake victims in Haiti, many friends who know of my close personal ties to that country sought to console me. Those ties began in 2001, when as an idealistic graduate student of sociology I undertook a dissertation project that compared how the Catholic Church assists Haitian immigrants in three cities of the Haitian diaspora: Miami, Montreal and Paris. For this research, I traveled twice to Haiti, learned French and Haitian Creole and conducted more than 140 interviews in Haiti and in the three cities. Knowing of Haiti’s poverty and the difficulty many Haitian immigrants face in obtaining legal papers, finding jobs and raising children outside Haiti, I focused my attention on the social service programs of the Catholic Church. In all three sites, particularly in Miami, the church actively promotes legal rights for Haitians, provides them with social services and participates in community organizing. I was especially interested in the role of religion and the place of faith in these programs. After months of observing religious services in Haiti and the diaspora, I learned much about faith as resilience—that is, as an ability to renew communities from within, to build solidarity and identity. An understanding of faith as resilience goes beyond most recent journalistic reporting about Haiti, which depicts faith as a way of coping with suffering. The materially poor do frequently have abiding trust in God’s goodness. Yet their faith does not offer an escape from it. Rather it gives comfort and the means by which they can endure and transform it. More than a drug (Karl Marx’s “opium of the people”) to ease suffering, faith is a proper, vital response to an imperfect social and physical world. Faith has the power to give meaning to suffering and to motivate people to ameliorate their situation. The Christian faith acknowledges the inevitability of some human suffering; God became incarnate in Jesus, who was crucified—an unspeakable experience of suffering. But Christianity also proclaims Jesus’ resurrection from the dead. Participation in religious rituals and sharing in the Eucharist renews Christian communities from within. Prayer, for example, is a powerful tool that encourages people to envision a better world and gives them the hope and energy to pursue it. Many Haitians have told me they understand prayer as an obligation to praise God, as a way of helping others and as a source of strength to continue the long struggle toward building a better world. Gathering to sing hymns of praise to God, to ask for forgiveness and to proclaim God’s goodness sustains individuals and helps them see themselves not only as victims, but as actors and participants. I had to rush home from my first trip to Haiti because my father fell critically ill. He died within weeks. A few months later, still grieving, I moved to the Little Haiti neighborhood of Miami to conduct research. When I mentioned the recent death of my father, Haitians responded so compassionately that I felt great consolation. Those I interviewed explained how they had never lost hope despite suffering violence, poverty and the deaths of loved ones. Their strong community solidarity and their stories of hope helped me to heal and gave me a deeper understanding of suffering. Being among Haitians led me to recognize a kind of spiritual poverty among many people in the United States—a profound loneliness and lack of meaning. Some who have witnessed the suffering in Haiti after the recent earthquake are prompted to donate money or travel to Haiti to help, which are noble responses. But can witnessing such disasters also lead people to change how they live at home? Is it possible to learn important lessons from the Haitians, from their example of resilience? Will these lessons help us to confront suffering even closer to us? Several friends have told me, for example, that even though they interact with people all day long at work, they seldom engage in a meaningful conversation with anyone. Sociological data show that in wealthy nations more and more people are eating their meals alone, living alone and reporting feelings of uselessness and depression. Have cultural ideas about the value of independence and autonomy gone too far? A proper Christian understanding of suffering emphasizes communion with others as a remedy for both material poverty and loneliness. Christian solidarity extends beyond the sharing of material goods to include a sharing of ourselves and our time—a scarce resource among hard-working people in wealthy countries. 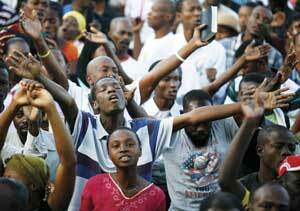 Christians have a duty to relieve suffering, like that in Haiti. But that duty is only part of the picture. Suffering is a reminder that humans are fundamentally dependent on one another, not just for material necessities but also for psychological and spiritual necessities. Although many live in isolation, humans are made to live in community. Working among Haitians has taught me that no matter how reduced a person’s material circumstances, every individual and community is able to contribute to the building of a better, more just world. Social projects ought to outgrow a paternalistic attitude, by which one group comes to the aid of another; givers help takers. People of faith recognize the dignity and integrity of those who suffer, see their faith and the strength of it in adversity and appreciate what it has to teach others who are not suffering at the moment. In this view, there is mutuality and equality: both parties are givers and takers. An e-mail message I received in January 2010 from Mario Serrano, S.J., who works in the Dominican Republic and in Haiti, illustrates how people in desperate circumstances can be quickly transformed from passive recipients into agents. After the earthquake, Father Serrano quickly gathered emergency supplies and drove them from the Dominican Republic to Haiti in a caravan. The military provided protection on the journey, and they arrived safely at night. The next day, however, neighborhood residents threatened to disrupt the relief efforts. Father Serrano was terrified when a mob pounded on the door demanding help. Even after they contacted the police, the people outside refused to leave and kept angrily calling out for food and water. The crowd finally dispersed when Father Serrano gave everyone a bottle of water and promised to meet with them to discuss how the aid would be distributed. Even persons experienced in working with the poor and trying to empower them need to be reminded from time to time that those who hunger, thirst and have no home can—no, must—contribute to the relief effort and also to those who assist them. The Haitian people continue to need assistance as do we who would help them. Can we learn from their faith as resilience how to let suffering make us more human? Can we live in communion with the others right next to us? This article also appeared in print, under the headline "Haiti's Resilient Faith," in the March 1, 2010 issue.